All websites that want to offer great user experience to their visitors from all over the world need to implement CDN services. One of the essentials of having a successful website is functionality and user experience and if you plan on offering content to people from all around the world, you need to give them the ability to access and download it quickly. Nobody is going to stick around and wait longer than they should get to the content they want. They will simply give up and look for what they need somewhere else. Learn what is a CDN, how it works and the benefits of having it on your website. CDN or the content delivery network is a system of interconnected servers located across the world that uses geographical proximity as the main criteria for distributing cached Web content and web pages to end users. When your website uses a CDN service, your website’s content exists on multiple servers around the globe, making it easier to distribute that content to end users according to their geographical location. Each user will receive the requested content from the closest server, which makes the entire process a lot faster. Content generated on the fly by the web server using any of several common web programming languages such as php, ruby or java. Videos or audio files that are played via a web browser control. Incapsula is a global network that uses intelligent caching and cache control options, as well as high-speed storage and optimization tools to improve your website performance while lowering bandwidth costs. In this section, we have gathered a list of top CDN companies you can talk to about improving your website. You can go through our expert reviews and real user reviews which are unbiased and they can help you see which companies excel in specific areas. On top of that, you can also learn the specifics about how they conduct their business and what options they offer to their users. The CacheFly serves content from 41 locations worldwide, ensuring the fastest and most reliable delivery of your rich media. CDN77.com is a no-commitment provider which serves more than 11,500 clients from Europe, US, South America and Asia. Fastly helps the world’s most popular digital businesses keep pace with their customer expectations by delivering fast, secure, and scalable online experiences. MaxCDN delivers your content on the fastest route possible with exceptional traffic shaping logic and wholly-owned routers. The Incapsula is a global network that uses intelligent caching, as well as high-speed storage and optimization tools to improve your website performance while lowering bandwidth costs. CDNlion is a content delivery network service provider that helps speed up websites, images, videos and other digital content. KeyCDN is a powerful and easy to use Content Delivery Network made speed up your games, software delivery, advertisements, CMS, websites and many more. CDNsun helps clients to accelerate their websites and media as well as their businesses. They provide high quality content delivery services at an affordable price. When you are in need of CDN services there are a lot of companies to choose from. All of them have different CDN options that might be more or less suitable for your needs. This is why we have put together this comparison chart of the top 10 CDN companies, where you can see their most important characteristics that can help you make the right decision when choosing one. 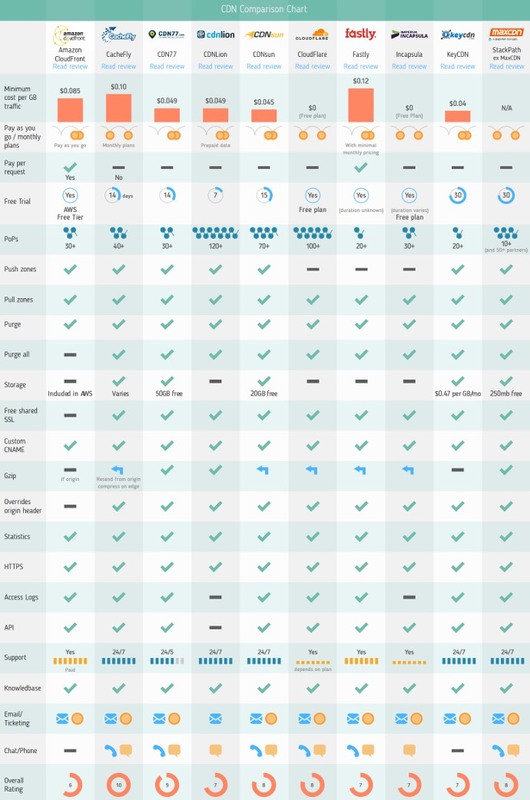 <a href="https://firstsiteguide.com/tools/cdn/"><img src="https://firstsiteguide.com/wp-content/uploads/2019/04/cdn-comparison-chart.jpg" alt="cdn comparison chart"></a><br /> CDN Companies Comparison free chart was created by <a href="https://firstsiteguide.com/">First Site Guide</a> team. Getting a CDN (content delivery network) is simply a must for some websites. If a website has visitors from all around the world, while at the same time having a large amount of traffic it is a good idea to get your own CDN. A CDN is a system of servers which are placed all around the world. Users that request certain content are simply directed to these servers based on their closeness and this is how they get to access or download content faster.